Black and white negative showing the Larry's B.A. Inter-County Senior Baseball team. They were the champions in 1954. This photograph is taken at Larry's B.A. service station at 1009 Brock Street South. 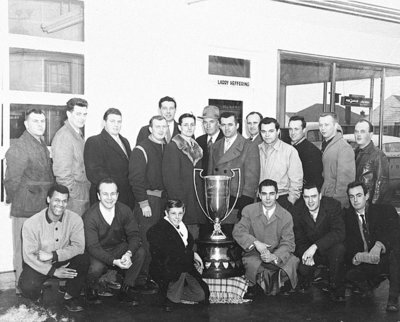 Back row: Larry Heffering, Ken MacDonald, Gord Hanna, Crabby Rakowsky, Fred Bidgood, Len Yuill, Jack Macdonald, Pat McCloskey, Hugh Sims, George Brabin, Cecil Hall, Mike MacArthur, Keith King. Front row: Jackie Bell, Frank Varga, _____ Newton, Don Crawford, ____ MacDonald, Mike Harrison. This team was sponsored by Larry Heffering, owner of Larry's B.A. service station. Larry's B.A. Inter-County Senior Baseball Champions, 1954, unknown photographer, Whitby Archives, 21-004-017.